If you are going to argue for bitless then you have to argue for saddle-less too. The argument being that if any equipment we use can cause harm to the horse then it must be rejected. In my experience of Craniosacral Therapy, working with horse ailments and injuries, I would say that there are certain hotspots for pain and discomfort in the ridden horse. There is no doubt that one of those is the horse's head. Mostly from tooth imbalances and neck injury from gadgets and front-end riding. The horses back is way up there too, and although there can be no true calibration of any of it, I would hazard a guess that more horses suffer from their back damage than their mouth. Narrowing that down, there is a lot of damage from plain old bad training - poor seats, unprepared horses, horses too young and too weak, and forceful riding techniques. There is also a VAST amount of damage caused by ill-fitting and poorly designed saddles. At least the majority of ridden horses have cartilage damage in their scapulae. Can you imagine the pain of a saddle forcing into your shoulders every stride to the point of your shoulder blades wearing away? And someone up there insisting that you keep going? 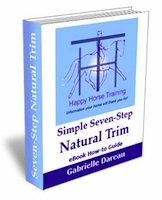 If a saddle ever comes anywhere near our horses shoulders, they make sure we know about it in a couple of strides, they don't have to tolerate it because we make sure it doesn't happen, or sort it out straight away if it does. So because there is a chance of this happening does that mean everyone has to start riding bare-back with a pad? The thing is that there isn't a simple line that has been drawn in life which says this side is 'good' and that side is 'bad'. We all draw our own lines because we all have our own reasons for what we believe. There are certain pieces of equipment that we don't use at HHT because firstly we believe they are used for the wrong intentions, and secondly because we think it is almost impossible to use them in a non-forceful way anyway. Those would include draw-reins, double bridles, spurs and saddles with metal in the tree. The way that we have decided that about each of these things was from hearing it from the horses in many different ways. 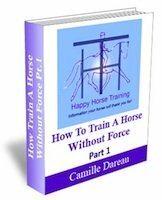 How they feel in their systems through energy work sensing, how they react, how they have been traumatised in the past, how they are to ride, how they progress in their training from month to month and year to year etc. It is all a process of discovery, and we believe in our answers because we have worked hard for them. We also know that they are not the whole picture. There is always more to understand. The important thing is to stay in each moment and listen to what happens in that moment. 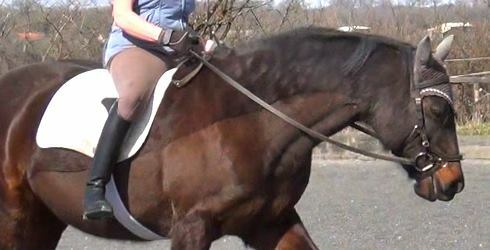 In the photo above, Ardeche was being ridden with a numnah because she didn't like her saddle at the time. It was a saddle made with her in mind, wide enough and one of the most sophisticated, ergonomic saddle on the market, yet she didn't want it. So she didn't have it on. At other times of her life she went bit-less because she didn't want a bit, and at the time of this photo it happens that she was happy with the bit. Because the bit gives us a more sensitive connection with the horse we like using them. When pain and tension are involved there can be no training, so if bits equaled pain we simply wouldn't use them. The most difficult thing to do is to have the patience and the open-mindedness to listen to the horse's opinion, and to make that compatible (somehow!) with your own opinion, and to do that every moment you are with your horse. It's not always going to work perfectly but making 'rules' and thinking that you then don't have to connect with it anymore is not the answer. Rules like 'I ride my horse bit-less so he is fine now' or 'I got my saddle fitted by an expert so it is fine now' or 'I got my horse 'checked out' and she has no pain'. If your horse tells you they have a problem then they have a problem. Rules don't exist in the present moment, and that is where we have to be to connect with horse. For a full explanation of why we prefer to use bits in our training approach, see this backissue of The Whole Horse newsletter. 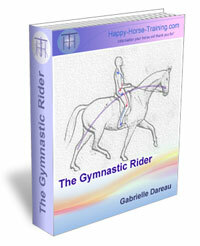 Return from Forget Bitless, What About Saddle-less to the Happy Horse Training homepage.